I’m astonished that Banjo Kazooie (BK) marked its twentieth anniversary this year. I clearly remember being four-years-old, passively watching my mother, young still at twenty-three, ambling her way through its first few levels. It wouldn’t be until a few years later, with my two brothers and I sitting cross-legged in a row, basking in the cool light of our family’s TV, that we would collect enough jiggies to make it to the later levels. I fondly remember scouring and scavenging for mumbo tokens along the ivy-covered walls of the ghoulish Mad Monster Mansion. I also recall feeling my little eight-year-old heart race as I counted eighty-nine notes but had yet to collect those in the Rusty Bucket Bay’s infamous engine room. Yet, no level is as arguably as memorable as its penultimate challenge, the ethereal forest that cements the game’s fairy-tale quality, Click Clock Wood (CCW). While good game design can be observed, it must be also felt and experienced. CCW was my first true introduction to excellent game design. Even as an eager youngster, traversing the level with an underdeveloped understanding of game design, I understood that CCW was a step-up from its predecessors. It was, as they say, in a league of its own – so let’s explore what makes it so memorable. It would be wrong to dig into the meat of CCW’s legacy without first describing the level. Aesthetically, CCW is reflective of its title – it is constituted by four areas that centre a giant tree-shrouded within a dense forest. 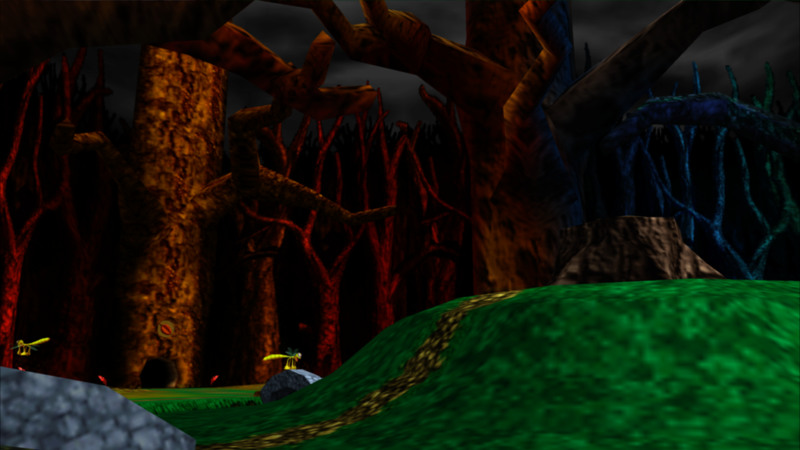 As the player, you can experience this area in four different seasons by unlocking each season within the level’s hub area – the only level in the game to have such a space. Entering the hub world for the first time is magical – it’s characterized by a certain stillness, and an overwhelming feeling of isolation and singleness as one is confronted by four closed doors. Yet, there is also a certain coziness and intimacy that is generated by the grey forlorn sky and the colourful, overarching trees that are both luminous guardians and area boundaries. Click Clock Wood’s hub world differentiates it from the game’s other worlds. Awe at the rich, colourful environment aside, it’s almost immediately understood what it is expected of the player – figure out some way to open the doors and momentarily leave this strange, still area. Exploring each of the doors, Bear & Bird are drizzled with light rain, snowflakes, and withered leaves instantaneously on their arrival to the hub’s seasonal areas. The switch that opens Spring is waiting patiently on the circular, crackled path that joins each of the doors, deceptively mimicking the shrouded wood surrounding it. Without hesitation, the switch is ‘beak bashed’ (a charming manoeuvre), and the door to Spring opens enticingly. Spring is the player’s first destination in the level, and thematically embodies what ‘Spring’ is popularly perceived as. Entering Spring for the first time, the sheer size of the level’s main attraction – the gigantic tree, quickly becomes confronting. In contrast to previous levels, CCW feels spectacularly large. Coupled with a forest floor, lush in its viridescent green and lethargically patrolled by an enemy and one lone, bee protected honeycomb tower, the atmosphere of ‘Spring’ is established. The cherry on top however, is the immediate presence of a melodious Grant Kirkhope track. Heavy on the woodwind (but with just enough xylophone), Spring’s theme is a delightfully light ear-worm that spurs thoughts of the syrupy scents of blooming flowers, or the trickling of sunlight from winter’s leftover clouds. There’s Vivaldi’s ‘four seasons’ and this is Kirkhope’s – this track is re-arranged again and again throughout each of the seasons, all of them reflecting the popular perceptions of what they represent. As you enter each for the first time, the seasonal embodiment changes but Gruntilda’s challenge remains the same – Bear and Bird must ascend what looms before them. The giant tree is the perfect playground for the player to express their platforming prowess. 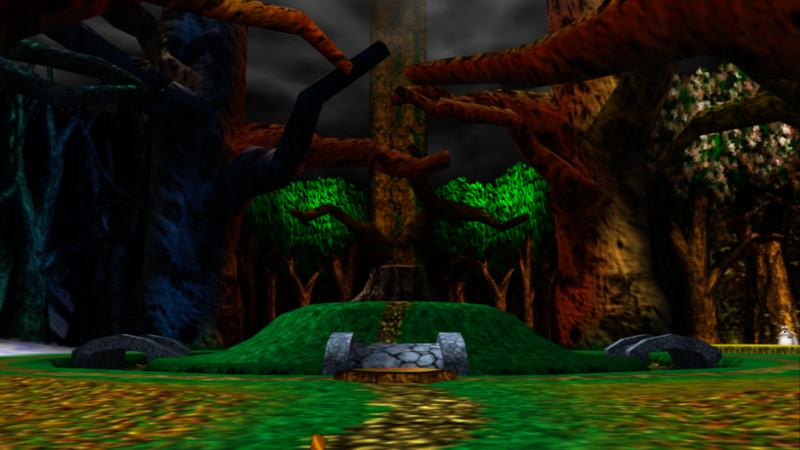 Banjo and Kazooie need to travel upwards to complete jiggy-orientated objectives, and the only path available to them demands mastery in BK’s platforming mechanics. Jumping, gliding, back-flipping, talon trot-ing. All are required in ascending the tree and collecting the miscellanies that BK idiosyncratically boasts. One misstep can see the furry duo fall steep and splatter on the forest floor below, costing precious honeycombs or worse, meeting a grisly fate. This is particularly ominous in the original Nintendo 64 version as collection of musical notes (100 total in each world) are counted on a ‘most collected’ basis, resetting when the world is left (purposely or otherwise). Love it or leave it, collecting musical notes and other major collectables in CCW stirs feelings of intense pressure, even by today’s Dark Souls inspired difficulty trends. The slippery, sky suspended boardwalk particularly remains a memorable area for pulsing heart rates and breath-stealing concentration. There’s also nothing quite like sliding down the icy, snow-covered tree in Winter, courtesy of a snowball hit from everybody’s favourite enemy, Sir Slush the Snowman. 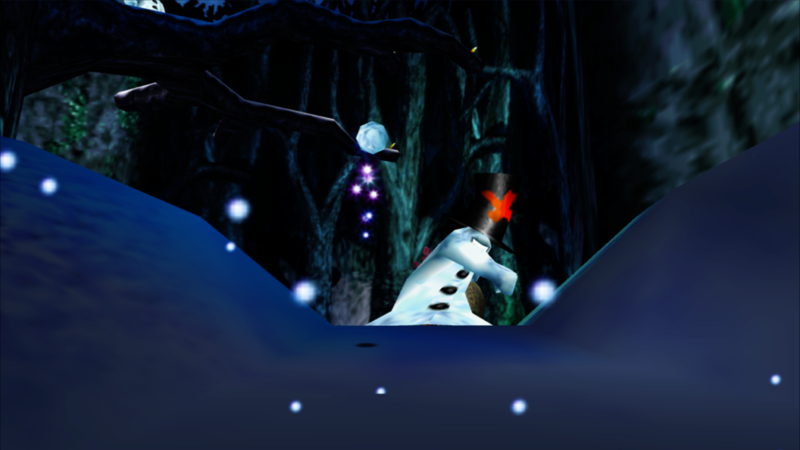 Sir Slush the Snowman strikes again and is a prime example of how the level uses strategic planting of enemies to increase its difficulty. Moving on to story, narrative isn’t BK’s strong suit, with its primary narrative being more or less a generic hero’s journey. For those who haven’t played BK, the plot sees Banjo (a young male bear) and Kazooie (his female bird sidekick) try to rescue Tooty (Banjo’s sister, the fairest bear in the realm) from Gruntilda (an evil witch) who wishes to covet Tooty’s beauty for herself. It’s not the most sophisticated plot line but it lends itself to the comical nature of the game. There is a red-line of minor narrative woven within CCW that is absent from earlier levels, however. Now, it’s undeniable that other levels do incorporate some major events. Events such as Boggy’s resuscitation in winter wonderland Freezeezy Peak, freeing Clanker in the dank and dirty Clanker’s Cavern, and scouring for Captain Blubber’s lost gold in the glittering waters of Treasure Trove Cove are all memorable highlights that contribute to BK’s light-heartedness overall. However, all these events feel loose and unconnected when related to other tasks within their respective levels. Caption: Jiggy tasks in Click Clock Wood are structured in a linear fashion and are informed by the logical succession of the seasons. CCW fundamentally challenges this established formula, integrating a narrative structure that is intended to connect events in linearity. Successful completion of tasks in each of the world’s seasons concur with this structure. Watering a seed in Spring will eventually see it flower in Autumn, rewarding the player with a well-earned jiggy. Feeding the baby eyrie worms collected throughout Summer and Autumn will see them gift you another jiggy and fly away into the cool Winter night. Even with their jiggy purposes complete, the flower plant will have withered, the Zubba’s nest abandoned, and Mumbo having left to seek out warmer lands in Winter, exist as merely three of many neat details in this meticulously designed world. It’s also worth noting that CCW feels like a bridge between BK and Banjo Tooie, with the sequel taking CCW’s penchant for intertwined tasks and extending them further with jiggies being achieved through tasks completed across numerous worlds. In retrospect, CCW indicated how Rare intended to expand upon and improve BK’s established design formulas, cementing its place as an abnormality among worlds. 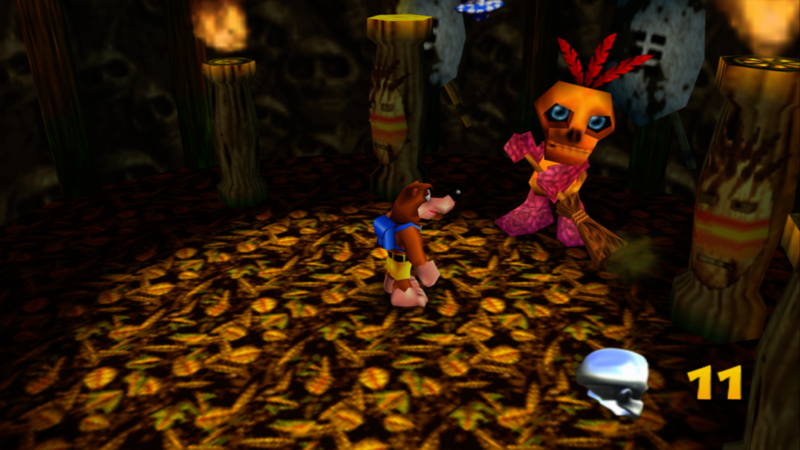 Even Mumbo is shown to be participating in the level’s effervescent seasonal themes. On a final note on jiggies, CCW does largely follow the standard formula established throughout the game. Some jiggies require tasks to be completed, while others simply lie about, waiting to be discovered. I found myself thoroughly searching throughout the level for jiggies: climbing the tree in all seasons, diving beneath the lake, checking in with Nabnut and the other idiosyncratic characters to ensure I hadn’t missed any hints. Although I mentioned that CCW incorporates a linear structure, it’s up to the player to uphold it – once all the door switches have been beak-bashed, the player is afforded complete freedom in which season they wish to explore. Searching the level high and low for jiggies can be frustrating due to its size. 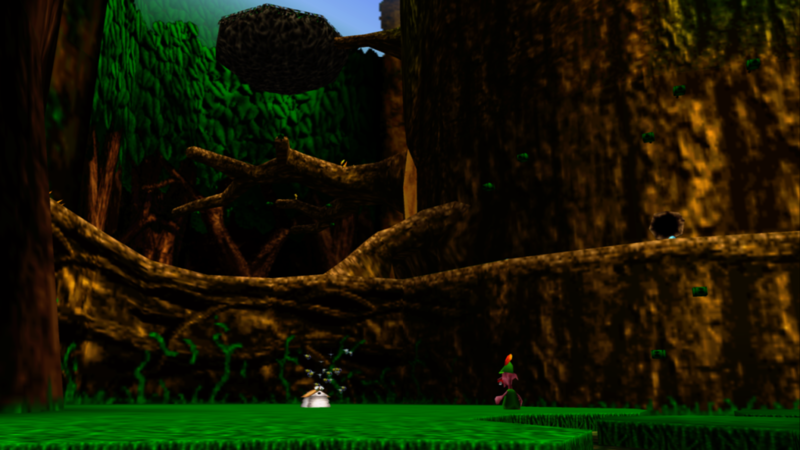 As a result, unlike levels as compact as Mumbo’s Mountain, or with highly intuitive pathways (such as Bubble Gloop Swamp), searching for major collectables in CCW can become frustrating. 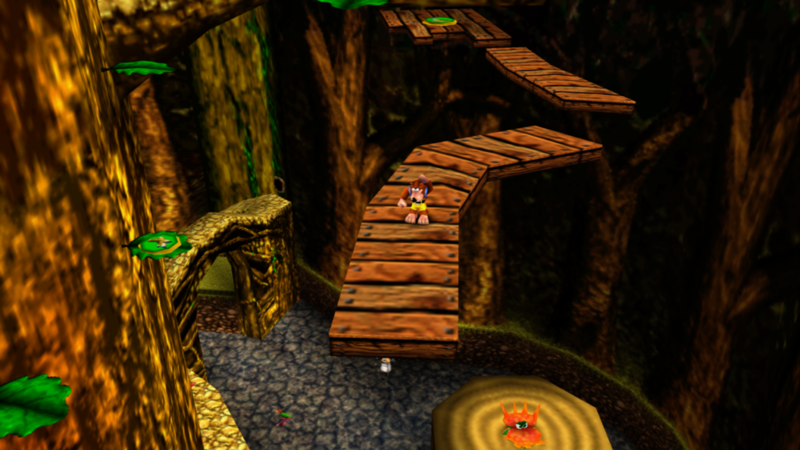 While it is an outstanding level, it isn’t without its flaws – the repetition of the tree climb becomes tedious, some level spaces are abnormally sparse and lack purpose, and some design elements (Spring’s leaf bud platforms, for example) are a bit cheeky – they’re unnecessary in elevating the difficulty of the level. Shout-out to the Zubba hornet fight also, as I’m sure that’s caused even the most confident player a sudden pang of terror. Regardless, I maintain that the positive elements outshine the bad, and I feel I can’t reassert enough the impression of mastery that Rare conveys in level design in the flow of the level. In entering the hub world for the final time, with each door opened, and every jiggy collected, I feel both sombre and powerful. 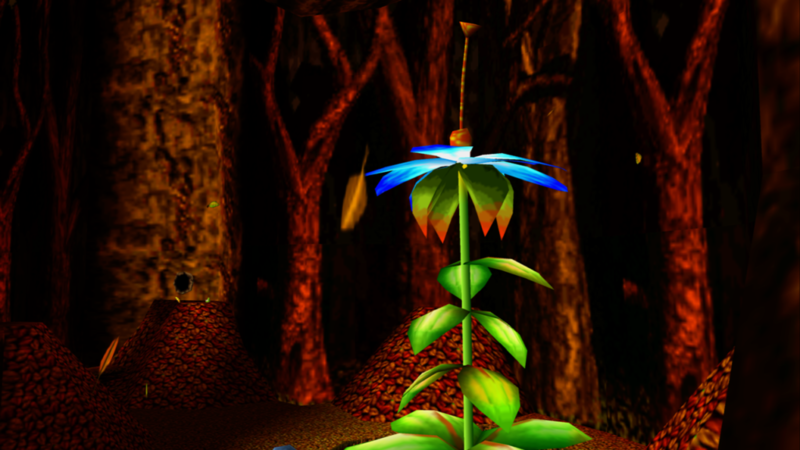 There’s this sense of utter suspension – in a rare twist, it is Banjo that is finally delegated a power; the ability to manipulate when he and Kazooie experience the seasons. 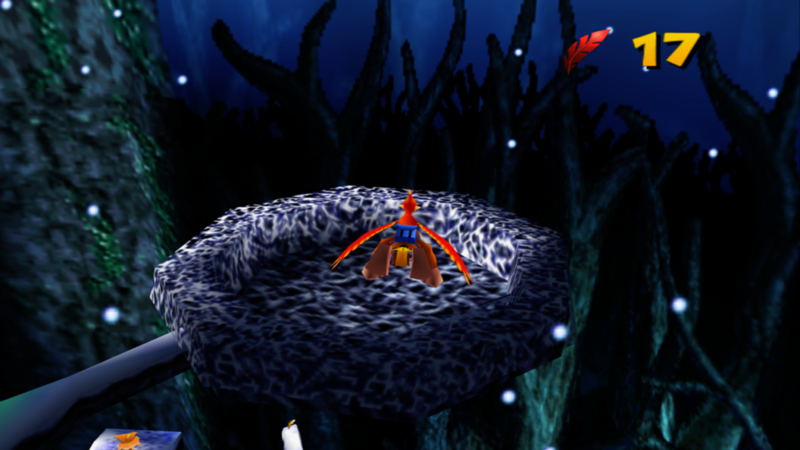 Visiting the hub area after the level is completed is bittersweet, signaling the beginning of the end of a classic platforming adventure. In a way, CCW is a conflicting metaphor for time. In forcing the player to traverse four seasons, not necessarily in the same order, it conveys the relative instability and flexibility of our temporal narratives. Alternatively, the player must unlock Autumn before Winter, Summer before Autumn, Spring before Summer. There is genuine comfort derived from the ensured succession of the seasons, a routine forced upon even the most liberal schedule. Yet, while it feels natural to attach numerous meanings to games as we age, it’s difficult for me to perceive CCW as anything other than a last collective ‘hurrah’, a celebration of the gameplay BK offered, and the jewel that sits squarely in its crown. Whether you’re curious, nostalgic, or have never heard of the title, Click Clock Wood is one of many reasons that Banjo Kazooie remains a classic platformer, no matter the ever-turning trends of development, creativity, and platforming – much like the four seasons themselves. J. Elliott is a PhD student in Media and Communication. When she’s not fueling her caffeine addiction, you’ll usually find her reading, writing, or resisting (but ultimately succumbing to) the urge to re-play Bloodborne, Dead by Daylight, The Witcher 3, or Nier: Automata again. Nice analysis. I came by accident, trying to figure out why I thought it was “Tick Tock Woods”. Making the analogy to Dark Souls is interesting, Click Clock Wood is one of the worst to get all the notes because it’s a marathon of “a” level. They even nerfed the XBox version (notes are collected across deaths) because people aren’t good enough anymore! For shame.